Discussion in 'Butler Recruiting' started by bumba, Mar 1, 2018. 5 star PG? Yes please. Pretty sure he’s got some baggage. A lot of baggage there. Who else would you want to have the ball in their hands? Baddley? Thompson? If the kid can score at our level, call him. We probably won't be the only school who does. I seem to recall several people on these boards begging to get Mark Smith a year ago. Where did u see this? Illinois was on the same level as DePaul this year, but he still played 20 minutes per game as a freshman in the Big Ten. I’m not actually researching this but I’d imagine the list of players who see that many minutes in the Big Ten as a freshman and don’t go on to have a successful career is pretty short. His numbers were bad this year because his shooting percentages are terrible. But he was an excellent shooter in high school and he shot 80% from the FT line this year. He took 69 3s on the year, so he obviously had the green light to shoot. I think there is every reason to believe he will come into shot as he gets confidence at this level. From a roster standpoint it makes plenty of sense. He would sit out next year and then essentially take Jorgensen’s minutes in 2019 as either a 3rd guard in the lineup or in a 3 man rotation with Thompson and Baldwin at the 1/2. He would be bumped to the 2018 freshman class which would provide class balance for Butler. I would be happy adding Smith. Butlerpharm12, bwesson15, dippper61 and 5 others like this. Is it a done deal he is transferring? Illinois has about ten guards on their roster along with a 5 star pg coming in. They have a bizarre roster make up. Wouldn't be surprised if they do have guards leaving. Mark Smith is 6'4" and 225. Although his shooting percentages were not good unlike AT he has a shot. We need a guard and at least one if not two bigs. I'd take Mark Smith in a heartbeat. He'd develop well. bumba, BHayden and Insane Dawg like this. Our Michigan offense doesn’t work if we don’t have guys that can shoot (let alone we stink at passing). How would he play in same backcourt as Thompson? Assuming his shot would improve, quite easily. The hope is that Thompson's shot will improve as well. How would he play in same backcourt as Thompson? Smith was Mr. Basketball in Illinois and can score. AT hasn't exactly shown that so far, although his defense has been solid. I'm sure we'd figure it out. 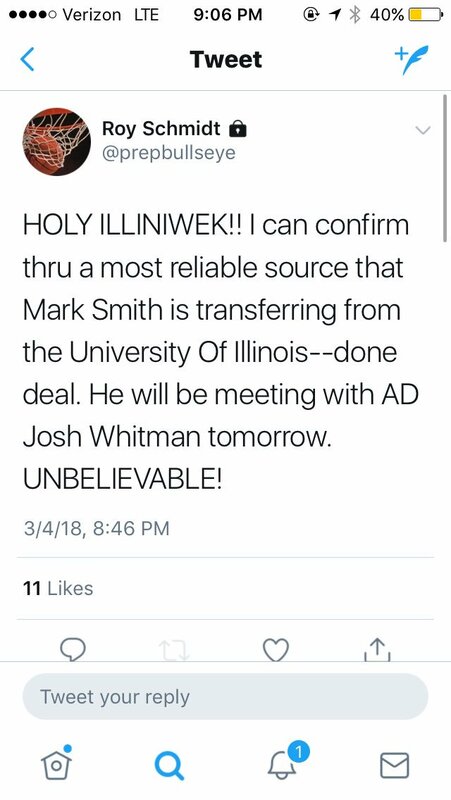 Confirmed he is transferring per Twitter. Freshman point guards are almost never good statistically. Do everything you can to land him. shoeevv and SnoopDawg like this.